I wanted to do my own hair and make-up for the party but my daughters advised me against it. They said I won't have the time nor the expertise to do a real good job. Daughter # 4 said that my make-up technique is obsolete! Oh well. I think I should really upgrade my skills on how to apply makeup as more and more cosmetic companies are coming out with products for Asian and Black women. 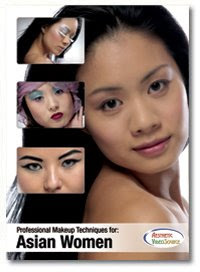 There are tons of information at Aesthetic VideoSource on the how to's of applying makeup. It's interesting to know that Asian makeup is done completely differently from Black makeup. Here's a sample video on how to apply Asian makeup. It is interesting to learn that different techniques are applied to achieve daytime makeup or natural look makeup, evening makeup and dramatic glamour makeup. Purchasing the complete makep-up video and studying it would make me a pro make-up artist! Wouldn't that be cool. If you are interested like me, go to www.Videoshelf.com for more information.